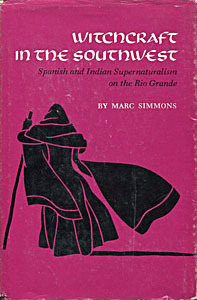 Marc Simmons, in his book “Witchcraft in the Southwest” examines Spanish and Indian supernaturalism on the Rio Grande. The book covers devil’s sabbats, were-animals, sexual rituals, mysterious illnesses and incredible cures. It is said these beliefs are alive today. Buy this book from me on Amazon.